Well, both those prayers are about to be answered with what is being referred to as Mortgage Helpers, coined by architect/developer Michael Geller, president of Univercity, a university-owned corporation developing a sustainable new community adjacent to the campus in the Vancouver BC region. It’s essentially a for-sale condo with a built-in self-contained rental suite that the condo owners can rent out as an entirely separate unit to help pay the mortgage, OR absorb back into the condo as a third bedroom as the need arises or the income allows. A flex condo if you will. He adds, “This is a clever way of providing a more affordable housing option, and greater housing flexibility”. I personally think the plan works best in a three-bedroom apartment, especially one where the bedrooms are on either side of the living room, but this plan seems to work as well. The 240 s.f. 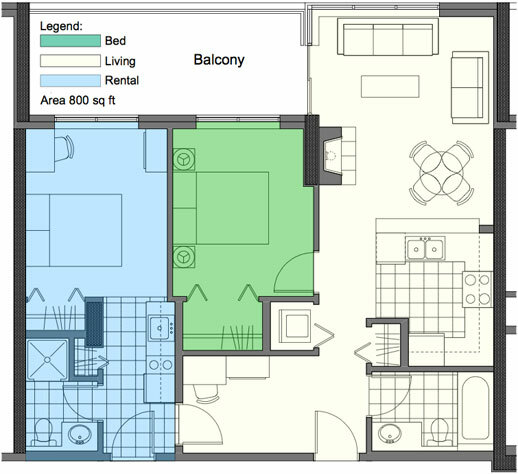 units are renting between $600 and $750 in our market area! See article for more info. What would you call them? Comment below!